It was the sight of peach juice dripping from the chin of a teenage French female nudist that led a Cambridgeshire public schoolboy to convert to Islam. 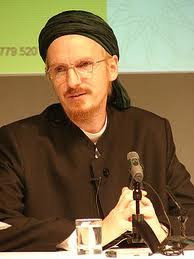 Thirty-five years later, Timothy Winter – or Sheikh Abdul-Hakim Murad, as he is known to his colleagues – has been named one of the world's most influential Muslims. The hitherto unnoticed Mr Winter, who has an office in Cambridge University's Divinity Faculty, where he is the Shaykh Zayed Lecturer of Islamic Studies, has been listed ahead of the presidents of Iran and Egypt, Mahmoud Ahmadinejad and Hosni Mubarak of Egypt, and the chairman of the Palestine Liberation Organisation, Mahmoud Abbas. "Strange bedfellows," he concedes. Tall, bookish, fair-skinned and flaxen-haired, a wiry beard is his only obvious stylistic concession to the Islamic faith. To the Royal Islamic Strategic Studies Centre (RISSC), which is based at the Royal Aal al-Bayt Institute for Islamic Thought in the Jordanian capital, Amman, Winter is "one of the most well-respected Western theologians" and "his accomplishments place him amongst the most significant Muslims in the world". Winter is also the secretary of the Muslim Academic Trust, director of The Anglo-Muslim Fellowship for Eastern Europe, and director of the Sunna Project, which has published the most respected versions of the major Sunni Hadith collections, the most important texts in Islam after the Qur'an. According to the RISSC, the list highlights "leaders and change-agents who have shaped social development and global movements". Winter is included because "[his] work impacts all fields of work and particularly, the religious endeavors of the Muslim world". International Institute of Islamic Thought – making him, at least in the eyes of the RISSC, Britain's most influential Muslim. observer who descends occcasionally from my ivory tower and visits the real world. If you stop most people in the street they've never heard of me. In terms of saying anything that makes any kind of sense to the average British Muslim I think they have no need of my ideas at all." If this seems an improbable background for a leading Muslim academic, his Damascene moment on a Corsican beach is unlikelier still. "In my teens I was sent off by my parents to a cottage in Corsica on an exchange with a very vigorous French Jewish family with four daughters," Winter recalls. "They turned out to be enthusiastic nudists. "I remember being on the beach and seeing conjured up before my adolescent eyes every 15-year-old boy's most fervent fantasy. There was a moment when I saw peach juice running off the chin of one of these bathing beauties and I had a moment of realisation: the world is not just the consequence of material forces. Beauty is not something that can be explained away just as an aspect of brain function." It had quite an effect on him: "That was the first time I became remotely interested in anything beyond the material world. It was an unpromising beginning, you might say. "In a Christian context, sexuality is traditionally seen as a consequence of the Fall, but for Muslims, it is an anticipation of paradise. So I can say, I think, that I was validly converted to Islam by a teenage French Jewish nudist." After graduating, Winter studied at the University of al-Azhar in Egypt and worked in Jeddahat before returned to England in the late eighties to study Turkish and Persian. He says he has no difficulty reconciling the world he grew up in with the one he now inhabits. "Despite all the stereotypes of Islam being the paradigmatic opposite to life in the west, the feeling of conversion is not that one has migrated but that one has come home. "I feel that I more authentically inhabit my old identity now that I operate within Islamic boundaries than I did when I was part of a teenage generation growing up in the 70s who were told there shouldn't be any boundaries." "Your average British Asian Muslim on the streets of Bradford or Small Heath in Birmingham is told he has to integrate more fully with the society around him. The society he tends to see around him is extreme spectacles of binge drinking on Saturday nights, scratchcards, and other forms of addiction apparently rampant, credit card debt crushing lives, collapsing relationships and mushrooming proportions of single lives, a drug epidemic. It doesn't look very nice. "That is why one of the largest issues over the next 50 years is whether these new Muslim communities can be mobilised to deal with those issues. Islam is tailor-made precisely for all those social prolems. It is the ultimate cold turkey. You don't drink at all. You don't sleep around. You don't do scratchcards. Or whether a kind of increasing polarisation, whereby Muslims look at the degenerating society around them and decide ‘You can keep it'." It is not this, though, that contributes to some young Muslim British men's radicalism, he says, since their numbers are often made up of "the more integrated sections". "The principle reason, which Whitehall cannot admit, is that people are incensed by foreign policy. Iraq is a smoking ruin in the Iranian orbit. Those who are from a Muslim background are disgusted by the hypocrisy. It was never about WMD. It was about oil, about Israel and evangelical christianity in the White House. That makes people incandescent with anger. What is required first of all is an act of public contrition. Tony Blair must go down on his knees and admit he has been responsible for almost unimaginable human suffering and despair." He adds: "The West must realise it must stop being the world's police. Why is there no Islamic represenation on the UN Security Council? Why does the so-called Quartet [on the Middle East] not have a Muslim representative? The American GI in his goggles driving his landrover through Kabul pointing his gun at everything that moves, that is the image that enrages people." "If the mosque represented an invading power they would have every right. Muslims in America are there as legitimate citizens with their green cards, with jobs, trying to get by. They are there in humble mode. "Would you oppose the construction of Shinto Shrines at Pearl Harbour, of which there a number? How long must the Muslims of lower Manhattan have to wait to get a place to pray five times a day? With Islam there are certain liturgical requirements. It's not like a church that you can build on the top of a hill and say, we've only got to go once a week and it looks nice up there. Muslims need to pray five times a day, they can't get the subway out and back. It should be seen as a symbol of reconciliation not antagonism." Last year Winter helped set up the Cambridge Muslim College, which offers trained imams a one year diploma in Islamic studies and leadership, designed to help trained imams to better implement their knowledge and training in 21st-century Britain. This year's first graduating class have recently returned from a trip to Rome where they had an open audience with the Pope. In an increasingly secular Britain, sociologists suggest with regularity that "football is the new religion". Winter understands the comparison. "Football has everything that is important to religion," he says. "Solidarity, skill, ritual, the outward form of what looks like a sacred congregation. Except it's not about anything." Just don't tell his brother. Cassius Clay, widely considered to be one of the greatest boxers, shocked America when he revealed in 1964 that he had converted to the Nation of Islam (becoming a Sunni 11 years later) to discard the name of his ancestors' enslavement. Born Steven Demetre Georgiou in London, the singer, best known as Cat Stevens, converted to Islam at the height of his fame in 1977. Two years later he auctioned all his guitars for charity and left his music career to devote himself to educational and philanthropic causes. The British journalist was captured by the Taliban in Afghanistan in September 2001 having crossed the border anonymously in a burqa. After her release 11 days later, she explained that she had promised one of her captors that she would read the Koran and it changed her life. She converted to Islam in the summer of 2003. The ex-Russian agent, who fled to London, fell ill in November 2006 after being poisoned by radioactive polonium-210. Two days before his death on 23 November he told his father he had converted to Islam.